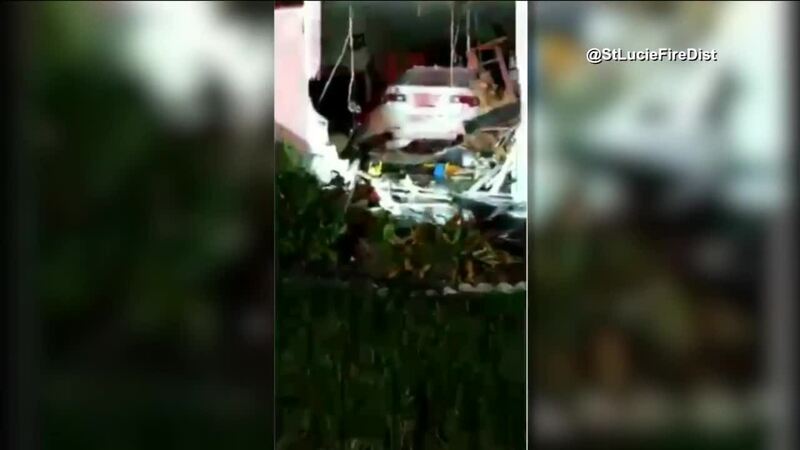 PORT ST. LUCIE, Fla. - A family was jolted awake when a drunk driver slammed his car right through their living room, said police. 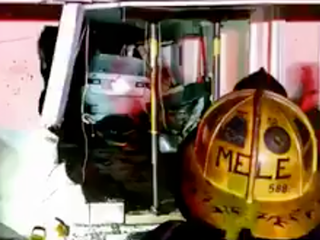 "I just woke up and the car is all crushed up in my house," said a mother to a 911 dispatcher. Terrifying moments for the Torresson family late Monday night, as a car barreled through their front door and demolished their home. "The biggest explosion I ever heard," said Carl Torresson, who was sitting on the couch watching TV. "All of a sudden the house goes completely black and I didn't know what happened." The crash happened around 10:45 Monday night in the 500 block of NW Twylite Terrace. Torresson said his wife was with their 8-year-old and 1-year-old boys in the back bedroom. The white Acura ran a stop sign outside the family's home, went airborne after hitting a ditch and blasted through the one-story home missing Torresson by inches. "I thought a bomb went off. I had no idea if it was a car, a plane or a jet," Torresson said. "It was like boom---then like boom and crash!" said neighbor Anthony Ferrara, as he described the sound of the impact. Neighbors like Joseph Patalano came racing across the street to help...after hearing Torresson screaming for his family to get out of the house. "We went into the house, the water was blowing all over the place and sparks were flying," Patalano said. "There was debris everywhere." Climbing over concrete and debris, Patalano helped carry the young boys to safety. "He just handed me the baby and that was pretty much my priority until I realized everything was alright," said Samantha Patalano, who also lives across the street. Samuel Massucci, 21, of Port St. Lucie, is now charged with DUI. Massucci was found sitting on the ground outside the home. Police said his speech was slurred and his eyes were bloodshot, and he admitted to drinking a few beers. According to an arrest affidavit, Massucci told police he was out celebrating because he only had one week left on his curfew from a prior drug charge. "This guy could have killed somebody last night so easily, it's unbelievable," Ferrara said. "We all make mistakes, but you have to learn from it, that's the big thing. I mean he could have killed my family over having too many drinks and driving too fast," Torresson said. Massucci remained behind bars Tuesday for violating his probation, police said. Torresson said his in-laws own the home. They are now looking for a new place to live, but the couple is so thankful no one was hurt.